Join me in a brief thought experiment: What would it look like if you followed God every time you felt His direction, urging, or conviction? Or if you were to say “yes” to God every time you felt like He was prompting you to do something, no matter how crazy or not? Just think about that for a moment. Imagine if you did that each day of your life. What would happen? I think we would see God at work in ways we could never imagine; we would see signs and wonders that demonstrate the power of God. More bluntly, we would see God in our lives. The same goes with our relationship with God. We listen to a sermon on Sunday and feel the Spirit tugging at our hearts, but we quickly write it off: “Oh, that’s just not practical”; “I’m not in a season where I can do that right now”; “Maybe later”; or “I just don’t think it’s wise for me to do that right now.” So many excuses! This is what Moses did in our passage for today. God called him to speak to Pharaoh in order to set the Israelites free, but Moses kept pushing back: “Send someone else! 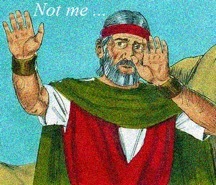 I can’t do this!” Unfortunately for Moses, God relented and Moses’ role was split with his brother Aaron. Moses to an extent missed out on something God wanted to do through him. May we never live in regret at missing out on what God wants to do through us! Since we all who believe in Jesus have received the Spirit, God wants to use ALL of us. Let’s not be a people of excuses but a people who say “YES” to the Lord. Remember that thought experiment, and let’s pray for that to be a reality in our lives! Prayer: Lord, help me to stop making excuses. I do it every day. I make excuses to limit my prayer and Bible reading, to limit the time I spend with You. Please forgive me for that. May I respond to You and Your presence without hesitation. Use me, Lord, for Your purposes! Amen.